1.Preheat oven to 350°F. Cook bacon in skillet according to package directions until crisp; cool and crumble. 2.In large bowl, with rubber spatula, fold cream cheeses, cheese blend, garlic powder, black pepper and bacon until well blended. 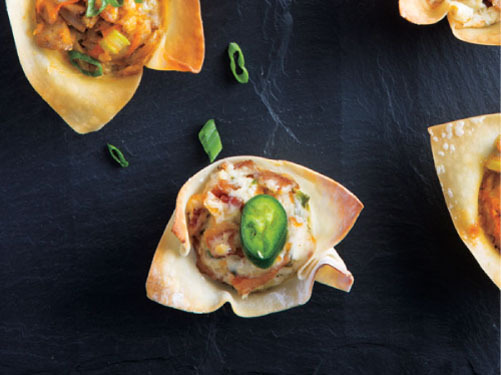 3.Spray mini muffin tin(s) with nonstick cooking spray; line each cup with 1 wonton wrapper. Spoon about 1 tablespoon cream cheese mixture into each wrapper; sprinkle with Parmesan cheese. 4.Bake 12 to 15 minutes or until wontons are crispy and golden brown and filling is heated through. Garnish with jalapeño pepper slices, if desired. Makes 24 bites.